From left, Kaitlin, Mark and Jordan Sampson are running the 2018 Boston Marathon in gratitude for the cancer care received at Mass General by two family members. It seems like the right time for Mark Sampson and his two daughters, Jordan and Kaitlin, to run the 2018 Boston Marathon together. With two family members now recovered from cancer, the Sampsons want to repay the doctors, nurses and clinical staffers of Massachusetts General Hospital who helped keep their tight-knit clan intact. 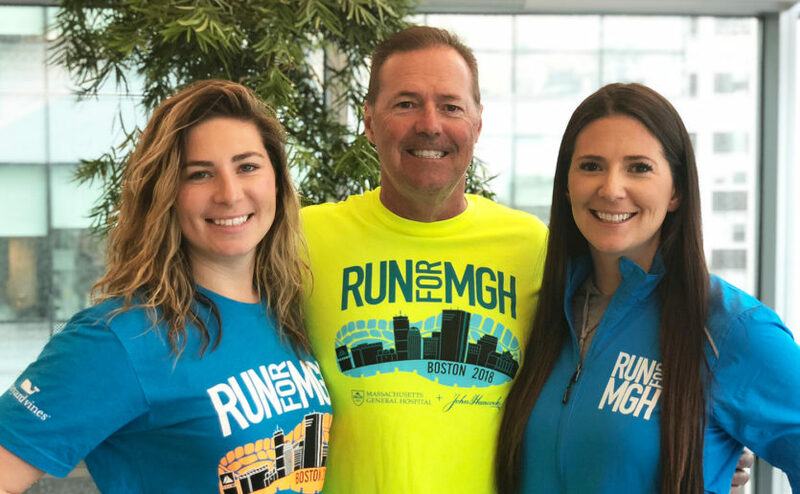 Mark, Jordan and Kaitlin will run as members of Mass General’s Pediatric Hematology Oncology marathon team, raising money for cancer care and research initiatives that enhance the quality of life of young cancer patients. Michael Sampson, the youngest of Mark and Jodi Sampson’s three children, was long under the care of the hospital’s Division of Pediatric Hematology & Oncology after being diagnosed with an incurable brain cancer when he was 22 months old. Given only months to live, Michael is now 21 and living happily with his parents in their Middleton, Massachusetts, home. The Sampsons believed they had endured more than enough of cancer after Michael’s many medical procedures at Mass General. But in 2006 and again in 2013, Jodi separately battled cancer in each of her breasts, receiving radiation treatments at Mass General. It would have been enough to devastate most families, but the Sampsons persevered, drawing on their religious faith and love for one another. Diagnosed with seemingly incurable brain cancer as a child, Michael Sampson is now 21 and living happily with his parents. In 1998, Mass General doctors discovered that the cancer on the right side of Michael’s brain had metastasized to his spinal fluid. Radiation treatment would have been harmful because he was an infant, so he instead underwent a stem cell transplant and chemotherapy for five years. Michael still has to occasionally receive treatment, a routine that has included more than 20 surgeries at Mass General over the years to replace shunts that blocked and couldn’t effectively drain brain fluid. Michael suffered brain damage when he was younger, but lives “as full a life as he can,” Jodi says. He attends Northshore Education Consortium, a school for children and young adults with disabilities, and works at Market Basket. “He’s a blessing to our whole family,” Jodi says. When Jodi was diagnosed with cancer in her right breast in 2006, Jordan and Kaitlin were then teenagers, and the significance of the disease hit them hard. Jodi made it a point to not change her daily routine, and her daughters noticed. “She raised three kids, and still went through radiation every morning at Mass General but was back in time for us to go to school in the morning,” Jordan says. She again drew inspiration from Michael after cancer was found in her left breast in 2013, and also found comfort in the advice of Barbara Smith, MD, PhD, who is director of the Breast Program and co-director of the Women’s Cancers Program at Mass General. “I love her,” Jodi says. “She is very pragmatic. She said after we found it the second time, ‘You know what, Jodi? It’s just bad luck. Let’s just do this, and do that, and you’ll get better.’ ” And Jodi did get better. Please consider supporting Mark, Jordan and Kaitlin Sampson and other runners raising money for Mass General’s pediatric cancer marathon team. This story was first published on the MassGeneral Hospital for Children website.